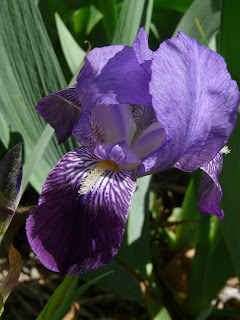 fluffnflowers: Rain, iris, and snakes. The past couple of days have been a great break from the rain. We had one day of high winds that took down part of a dying Bradford pear, so I'll have plenty of mulch this year for my beds. My flowers are blooming and I've had a lot of visitors. And here's a little guy that visited last week. He was only about 12" long, but he gave me a start when I saw him sunning himself on the patio. 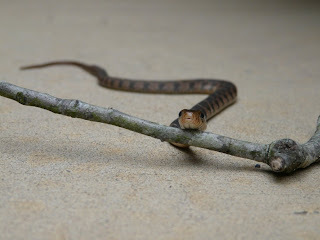 I think we positively identified him as an East Midland Water Snake. He was completely non aggressive (but very slippery! ), so we picked him up and carried him back across the street to the pond.